Everest Tab – is a Powerful Premium WordPress Plugin to display tab with various components. This plugin is one of the best premium wordpress tab plugin to show different inbuilt as well as custom shortcode components inside tab content with 20+ pre available beautiful and responsive tab layouts. 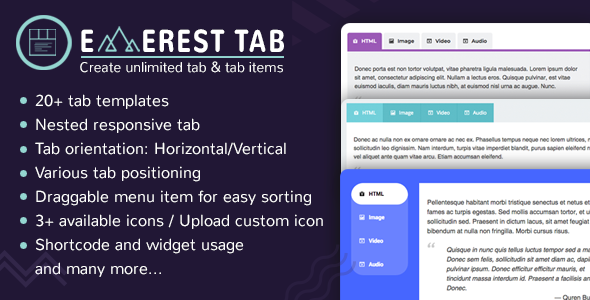 A standout amongst the most powerful tab display platform with 20+ pre available templates to show various components in its specific tab content section in an most attractive and easy way. Display tab components using generated shortcode or even transform your own custom html content into tab layout in easy way. This plugin is useful since you can display different components such as html, social feeds, recent posts, woocommmerce products, contact form , google map integration as well as external shortcode with tab layout. Showcase your tab compontents in the most appealing way. Drag & drop tab item for easy sorting. Deep Linking – Enable/Disable deep linking and makes URL change automatically on click tab and easily link to specific tab with hashtag to bookmark it easily.